UNCASVILLE, Conn. (March 15, 2017) – The Connecticut Sun will mark its 15th season in the WNBA with a special logo, and fans are invited to contribute their photos to a commemorative mural that will be displayed all season on the concourse at Mohegan Sun Arena. The logo (seen above) will be worn on the Sun home and road jerseys throughout the 2017 season. A celebration to mark the 15th season will be held when the Sun host Sue Bird, Breanna Stewart and the Seattle Storm in an ESPN2-televised game on June 29th. Select members of the inaugural 2003 team will return to Mohegan Sun Arena to be a part of this special night. 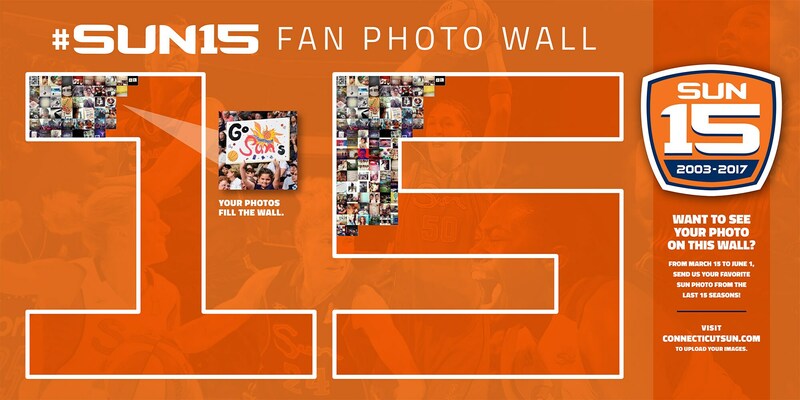 Fans can submit their photo from Sun games through the years between now and June 1 by uploading photos here. Select memories will be included in a collage that will fill in a large, framed “15” mural, which will be featured prominently on a concourse wall in Mohegan Sun Arena all season long. To see the mural, visit ConnecticutSun.com.